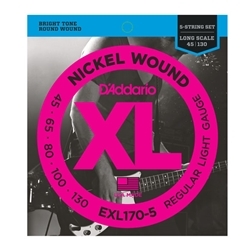 EXL170-5 is the 5-string version of the best-selling D'Addario bass set. With the addition of the .130 low B string, EXL170 offers the ideal combination of distinctive brightness and booming, tight lows. The most versatile and universally appealing set for all playing styles. Fits long scale basses with a string scale length of up to 36 1/4 inches.